Once again this September, Atlanta will become the center of the world for EDM for one weekend as Imagine Music Festival 2018 celebrates its fifth year with a blowout event at Atlanta Motor Speedway. As always, this lineup is stacked with massive names, loads of local love and a great mix of mid-tier names that make this an overall very strong lineup for lovers of all types of dance music. You’ll have to hustle to catch everyone you want to see, so we decided to break this lineup down to make things a bit more manageable for you as you plan out your must-see list. Here we present our five most obvious, big name acts-to-see, alongside another five that you may not know about, but that we simply can’t let you sleep on. For visitors to the city of Atlanta, we’ve also included a short list at the end of five locals who you will want to check out if you want to see the real underground bass scene of the Southeast in action. These lists aren’t intended to highlight the “best” artists by any means, these are simply names that we have our eyes on, and who we think represent an interesting enough live experience that these sets would be worth anyone’s time to experience. We also realize that for many of the attendees, this will be their first big music festival, so we hope that this may serve as an optional guide for any newcomers to the scene, taking them through a few different angles of the wild, wonderful world that is an EDM festival. Bassnectar - This one is kind of a no-brainer. Whether you're a fan or not, there aren’t many artists that can compete with the sheer audio-visual spectacle that Bassnectar offers. It’s a wild and epic display of ridiculous proportions, and the devoted community of bassheads that will be in attendance will provide a crowd atmosphere so unique that it is itself part of what makes his shows important experiences for many people. Zeds Dead - These guys are already veterans in the timeline of the American EDM scene. Label-owners, prolific producers and skilled DJs; this duo remains an act that demands attention. I’ve seen them play some sets that were better than others, but that variance is the cost of seeing artists who experiment, and Zeds Dead remains adaptive. Griz - A Griz show is just great bang-for-buck fun. He’s a serious artist and it isn’t all bangers, but when things really get going, there’s some crazy energy in the air at a Griz set. Appealing to funk-lovers and head-bangers alike, Griz spreads a message of groovy, equal love that radiates out from the Colorado mountains and across the stages around the world. Green Velvet - With a placid demeanor that belies the absolute fire tracks in his collection, Green Velvet is one of the most consistent and exciting artists in the world of house and techno. He’s been on the must-see list for several of us at Bullet Music, and when he was announced on the Imagine Lineup, we knew we’d have to make certain to catch his set. 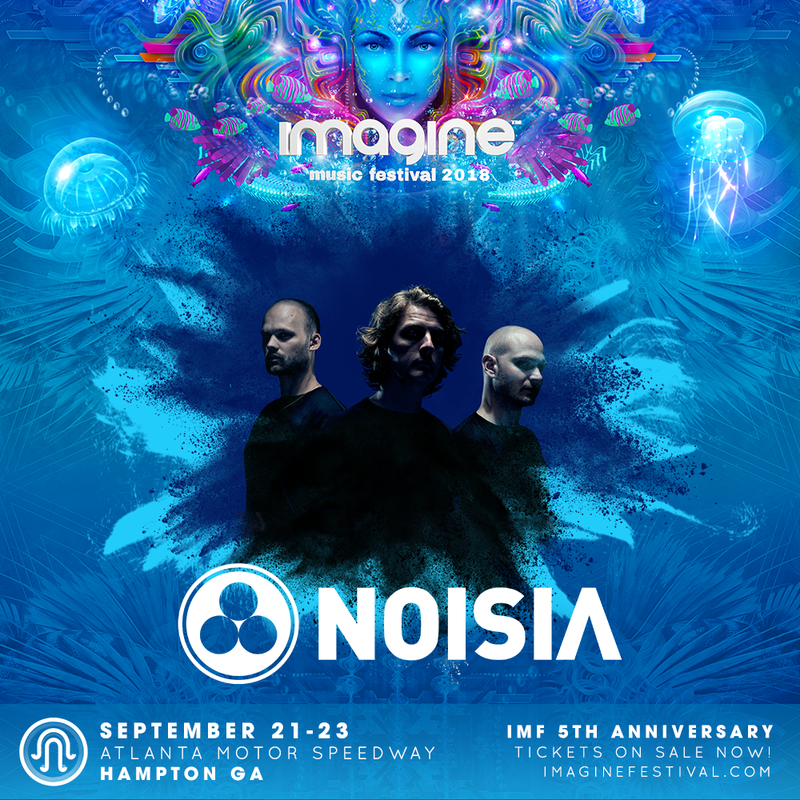 Noisia - Absolute kings in the world of DnB, Noisia was one of our favorite sets at Imagine last year, and it’s fantastic to learn they’ll be making their return on a bigger stage with better sound. Drum and Bass may still be a relatively overlooked genre in the United States, but anyone who catches this set is sure to have their eyes and ears opened to the immense energy and jaw-slapping power that the genre has to offer. Shpongle - A legend is the psy scene, this set from Simon Posford might not attract too many ravers, but we hope that some new ears will try out his sound. Spongle’s music draws on so many global influences and pulls in so many world textures that serious fans of music will be drawn into the psychedelic rhythms, regardless of their favorite genre. Cashmere Cat - A prodigious producer who has worked with, flipped and engineered so many great tracks over the last several years, Cashmere Cat is constantly surprising his fans with new music that breaks all boundaries of genre in pursuit of melodic perfection. He’s a master songwriter as well as a talented audio engineer, and he is sure to offer one of the happiest, most exuberant sets of the weekend. Walker & Royce - House heads will already know the deep and melodic sounds of this Brooklyn duo, but for anyone still on the fence, we really have to urge you on this one. If you enjoyed the vibes at Claude VonStroke’s set last year, or have seen any of the amazing curation in the house scene that Imagine has delivered in previous years, then you know that this is a must-see act that will deliver some of the thickest dance floor vibes of the whole festival. Liquid Stranger - Fans of neck-breaking dubstep who can't get enough of artists like Excision and Getter owe it to themselves to check out this Swedish maniac. At the helm of left-field bass music label Wakaan, this singular artist has carved out a unique space for himself in the world of dubstep, and he's sure to match hammering beats to some of the wonkiest melodies you'll hear all weekend. Ivy Lab - Monster halftime production born out of the long tradition of two-step, garage and DnB marks Ivy Lab’s style and they are pioneers of some of the most adventurous developments in bass music sound design in recent years. If you are down to rage in a sweaty pit to alien beats, then this is a must-see act for you. If you’re visiting Atlanta just to attend Imagine, and you want to get in touch with the underground bass scene, try to make it a point to see some of the names on the festival undercard, as the selection of talent is impressive all the way down to the small print. We suggest that you make every effort to catch the performances of Andy Bruh, JuJu Beats, Ployd, Clerks and Leet. These five mainstays of the Southeast bass music scene have been among our favorite artists for years, and we're very excited to see Imagine Music Festival giving them and others the opportunity to reach new audiences as music lovers from around the world converge on Atlanta this September.